Young ticks have six legs, and mature ticks have eight legs. They vary in size and appearance depending on the species. The most common ticks are the deer and American dog tick. Ticks are blood-feeding parasites that are often found in tall grass and shrubs where they will wait to attach to a passing host. 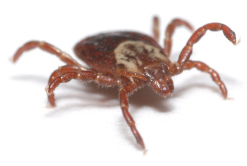 A tick will attach itself to its host by inserting its feeding tube into the skin. The tick feeds on birds, reptiles and small mammals. The adult female tick needs a large 3-day blood meal from the deer before she can reproduce and lay her 2000 or more eggs. Deer are the primary host for the adult deer tick and are key to the reproductive success of the tick. They can spread various diseases such as Lyme disease, Rocky Mountain spotted fever and other tick-borne diseases.